My co-worker brought a batch of these to work. 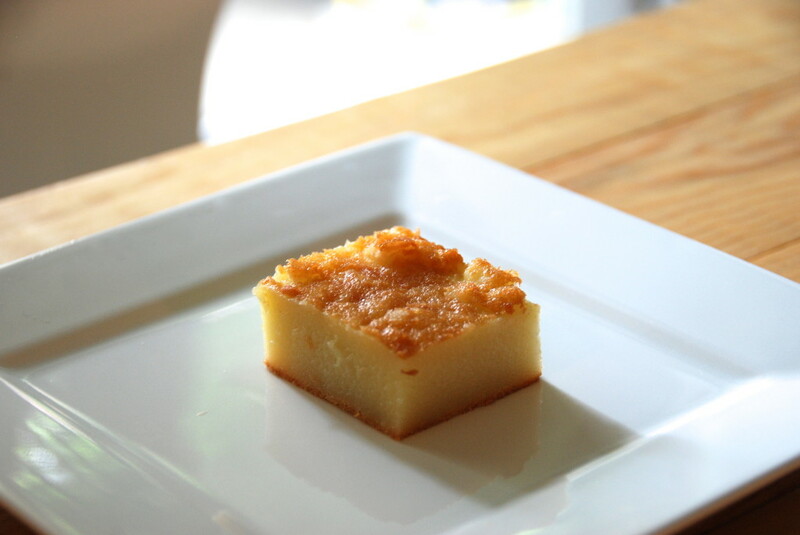 It’s delicious, and reminds me a lot of my mom’s homemade korean rice cakes. Recipe here. Recipe: Moroccan Chickpeas with Chard. After eating baked chickpeas in Greece, I’ve been kind of obsessed with them. This recipe is an excellent winter weekend soup to make in a big pot. I didn’t have preserved lemon on hand, but sub’d the juice of one lemon. I also forgot to grab a jalapeño and added a tad more cayenne. I also watched the video after making the recipe, and Melissa’s is definitely more stewy. Perhaps why I also didn’t bother with rice, and ate it straight. Delicious. The last time I was in Korea, my cousin took me to a restaurant that was popular for budae-jigae, which is a stew that came to be during the Korean war, because army soldiers would make it with all the bits that they had on hand. 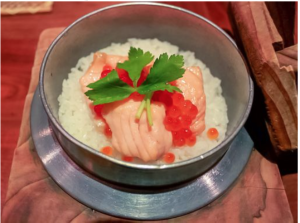 It’s pretty delicious, because it can have any of the amazing non-perishable foods such as ramen, spam and/or hot dogs, all alongside veggies, tofu, rice cake and kimchi in a spicy broth. So, we’re eating this delicious stew, and my cousin tells me that this restaurant’s secret to the amazing flavor is that they add in American cheese slices. 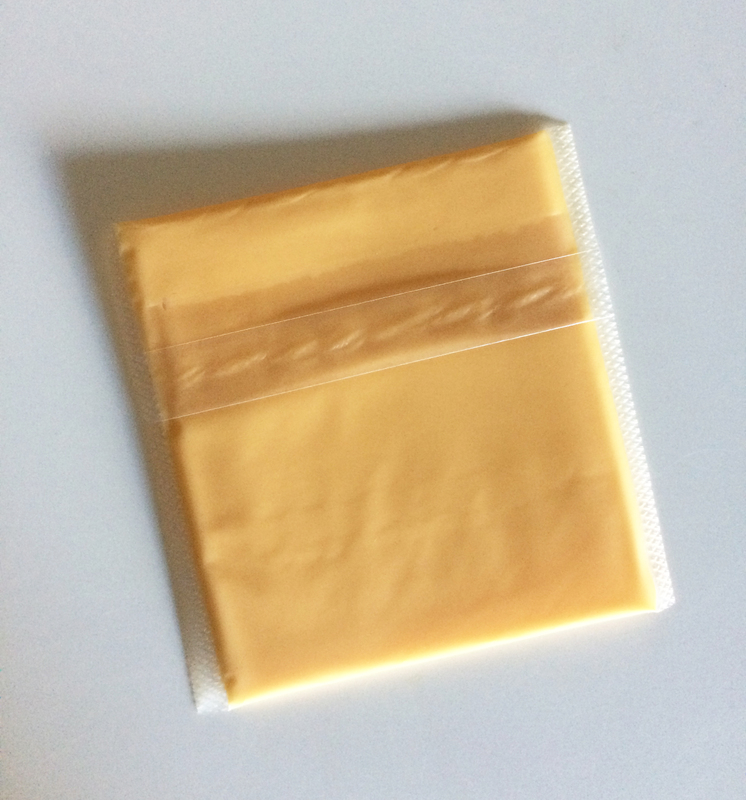 And this cousin, who spoke near perfect English but wanted to be clear, confirmed that it was The American Cheese, the kind that is wrapped in those individual plastic sleeves. I will tell you that ONE of those yellow plastic wrapped slices was PLENTY, and I did not add the pat of butter. I did fold in a dropped egg (which I normally do when making ramen at home), when it is still boiling and slightly more mixed in so it’s a bit more like egg-drop soup. I used the Korean Jin Ramen brand (which is nice and spicy), and also topped it with some Kimchi. This is definitely not an everyday meal, but a very special treat. Being that I am trying my best to stop eating processed foods [Roy Choi is to blame! 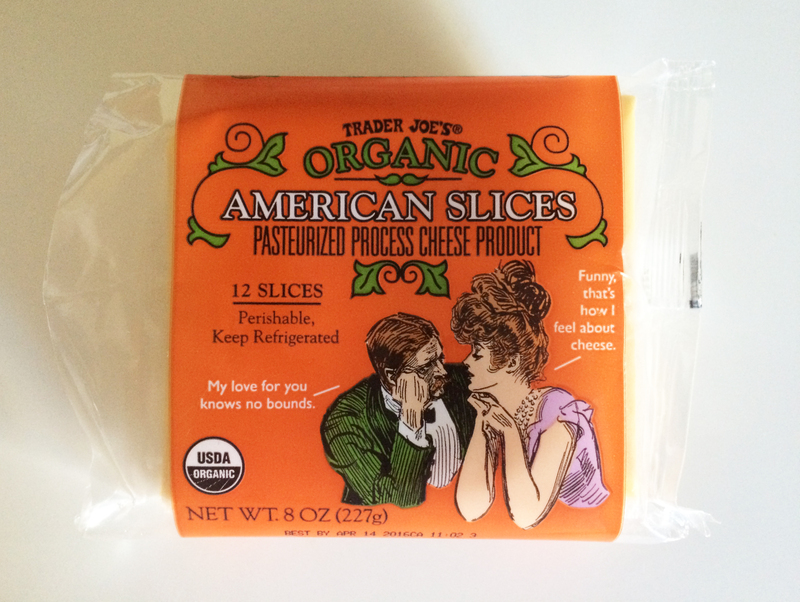 ], I did a little poking around to find the story behind American cheese. The FDA actually banned Kraft from calling it cheese, since it was less than 50% cheese. That’s why the package came to say “Kraft Singles.” The story of its invention is summed up in this article. 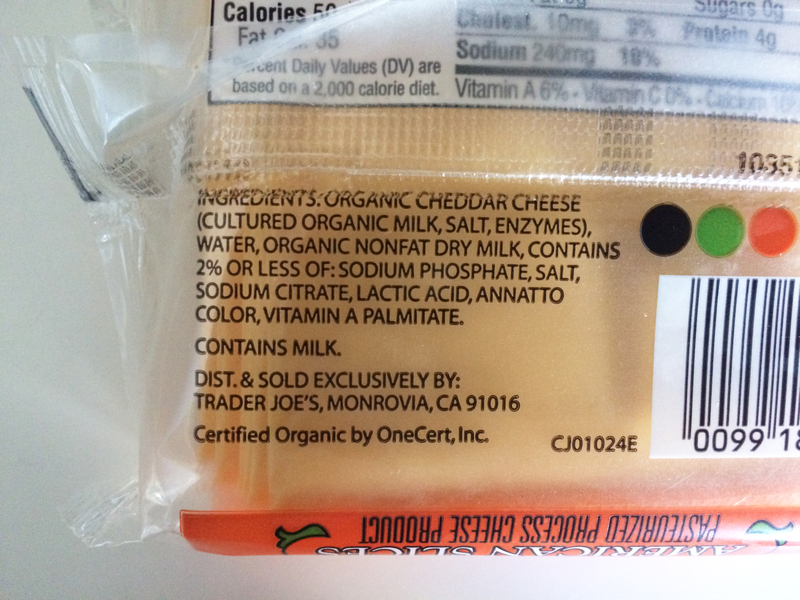 I bought my package from TJ’s, where the organic slices do seem slightly more legitimately made of cheese, even though it is still labeled as “Pasteurized Process Cheese Product.” As a (reluctant) sidenote, this is also lovely on toast with a drizzle of Mike’s Hot Honey. Poster by Farner Rudolf Werbeagentur. 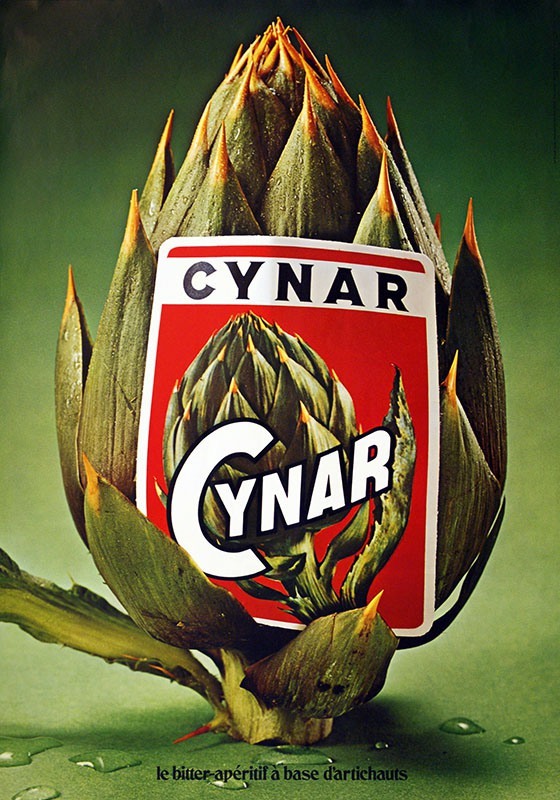 Cynar is an artichoke based liquor, with herb intonations and a genorosity of sweetness which gives its cocktails the profile of a gentler, ever-slightly prettier younger sister of the Negroni. I once had it straight in a fancy bar in Boston called Drink, and it was not what I expected. We had a conversation with the lovely bartender about the cocktail I and my friend fell for when we were traveling together in San Diego, the Bitter Guiseppe. It is an incredibly simple cocktail, certainly easy to make at home (as I made it for the first time for Thanksgiving pre-dinner cocktail hour). The main detail that I would say is crucial, is to use a big ice cube (or a pile of ice that peeks out on top) so that you can sprinkle salt that will sit on that edge as you go for a sip. The mix of hitting that salt, with a sip of the Cynar mixed with vermouth is the perfect definition of sweet + savory. Combine ingredients in Old Fashioned Glass over ice. Squeeze juice into the drink, twist peel on top, and stir. Sprinkle top of ice with salt and serve. 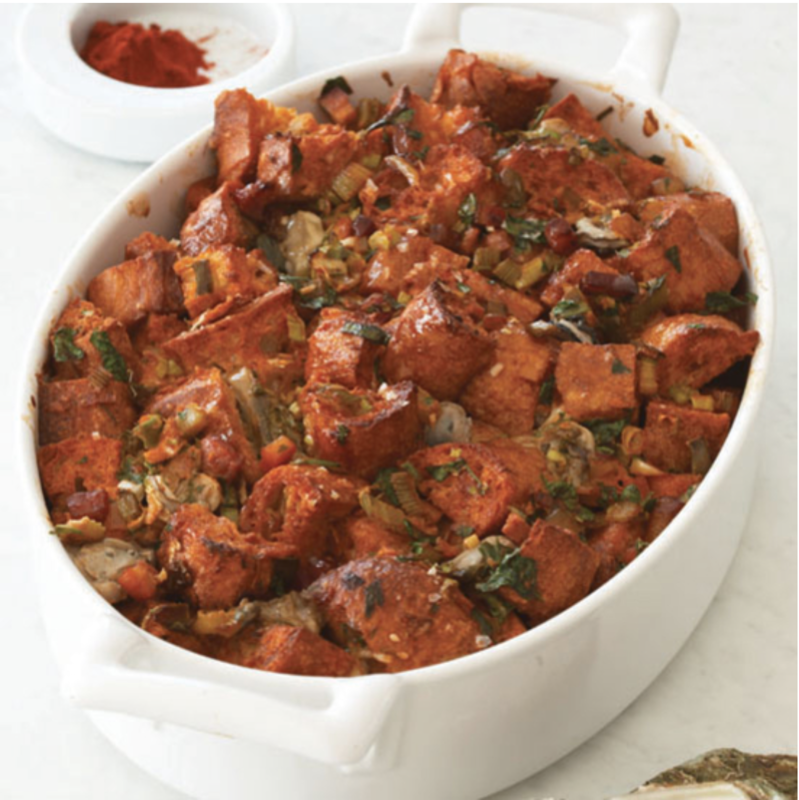 This oyster stuffing dish by chef John Besh has become a staple at our Thanksgiving dinner. Be warned; you must love the flavor of oysters, as the briny flavor that comes through is not subtle. It’s what I’m most looking forward to eating. I find this recipe interesting, because it skips using bread, something I always thought was integral to the creamy Andalusian gazpacho I know. Julia Moskin’s story behind it is fascinating. Excited to give it a try. Also, the video above – love that there is no need for words or explanation. The future of cooking videos? What do watermelon, ice cream and pickles have in common? They’re so super perfect in the middle of summertime! 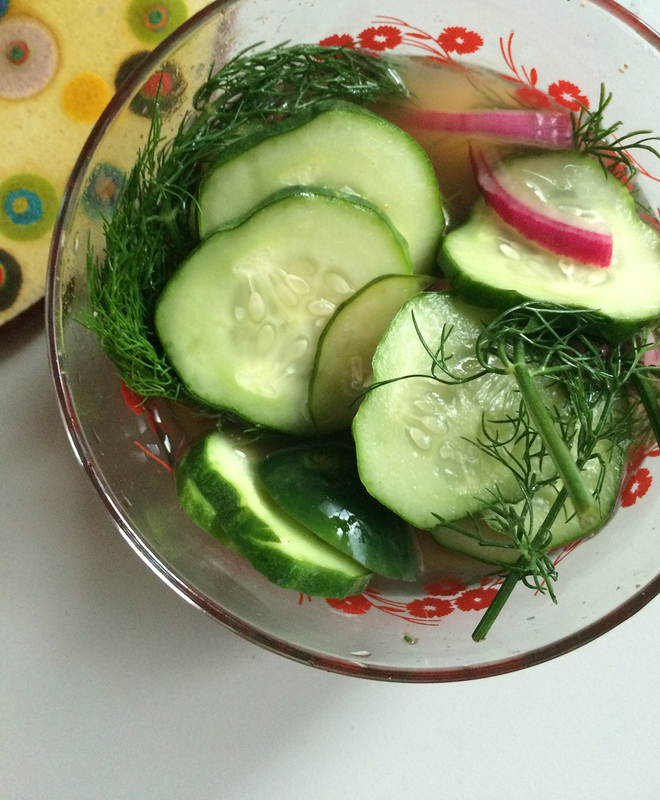 I recently learned how to make quick pickles, which are basically pickles that you can make and enjoy as soon as about an hour after marinating. In the past, I learned how much quick pickling red onions will transform the simplest of fish tacos with this really simple recipe. I like adding a spoonful of sugar, to give it some sweetness. I have also regularly made Korean cucumber kimchi, with this recipe which is equivalent to a quick pickle. But the latest is the dill quick pickle. Loosely following this recipe, I’m outlining below what I think is the best combination, for a small batch to fit in my under the counter fridge. You can quick pickle all kinds of things other than cucumbers: including kale stems (leaves removed). You can also add in different herbs and spices – when I last did kale stems, I added in a squeeze of Siracha. Heat the vineger to dissolve the salt and sugar. I used 3 small containers, but it kind of doesn’t matter- you can use one large jar if you want. With 3 small containers, I put a stem or two of dill and one garlic in the bottom, and filled with cucumbers and onions. Pour the hot vinegar mixture over, it should fill about 1/3 – 1/2 of the the container (if it doesn’t just pour in a tad more vinegar). Then I fill with tap water to about 3/4 the container. Not all the cucumbers will be covered, but don’t worry, they will start to extract water and in about an hour will fill naturally. Put it in the fridge, and shake every once in awhile. Pickles are ready to eat as early as 2 hours later, and can stay for 2 weeks. Go and play! A lot of recipes do not call for adding water, I like to add it so the pickles aren’t too crazy sour and I can eat them straight. Other recipes nix the sugar and use more salt. You decide what you like best! Photo by Andrew Scrivani for The New York Times. 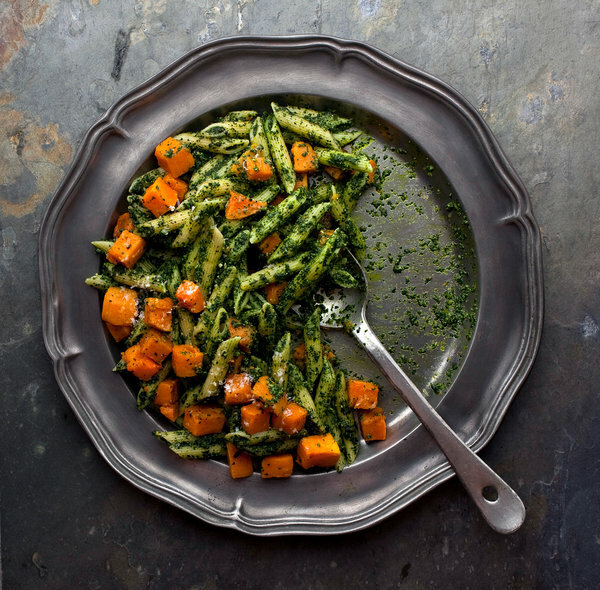 Kale pesto is the same as regular basil pesto, but a little different. I like that it is a little bit more subtle, and it’s nice to have an alternative to using kale (which I’m more likely to have on hand than a bunch of basil). I happened to have a some basil, so went ahead and added in a handful for good measure. I made this recipe without the squash, and the easy thing is you can add in anything that might sound tasty to you. Roasted veg, sautéed garlic shrimp, fresh tomatoes and/or ricotta salata all seem like good alternatives to mix-ins. You can also sub walnuts for the (pricey) pine nuts, just remember to toast either as that will make a big difference. The pesto also does fine going in the freezer, so if you’re like me and wrestle with the tiny food processor and end up making a big mess on the countertop, all the more reason to make a big batch and freeze half for an easy meal later. Update: I had about a 1/4 cup of the pesto leftover and tossed it with couscous, grilled chicken, fresh cherry tomatoes, ricotta salata and Maldon salt flakes . YUM! I highly recommend this pesto that keeps on giving. This recipe is very tasty and would easily go on soba, roasted veg, or anything else your heart desires. Being from the south, I’m a sucker for a good pasta salad. This one tastes fresh and is not as heavy as the mayo based ones I yearn for in my childhood memories. As Food52 notes, it’s the perfect dish for a picnic since it won’t spoil as easily either. 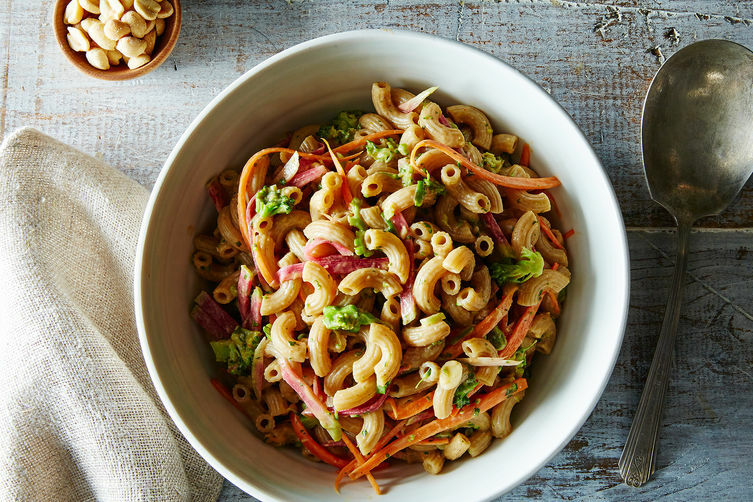 Get the recipe here: Miso peanut pasta salad.